I’m super psyched about my showcase lineup for Montreal. Partnering again with Access Film Music in their blue room. I’m not super psyched about the tiny hotel rooms.My usual audience is not going to fit into the room, I encourage you to come early to get a seat. The first music was social music. Scientists have found musical instruments dating back 40,000 years or more, but anthropologists feel music is much older, maybe as much as half a million years, predating any recorded history, perhaps even language itself. There is something very elemental about making and sharing music. My earliest musical experiences were my grandmother singing me to sleep. Soon, I was singing with her, it was a cornerstone of our bond. Not long afterward, I was singing in the congregation and later the choir at church. I got up in front of my 3rd grade class and sang a Beatle Song (If I Fell) acapella. I sang in the school bus on my way to day camp. (0n top of Spaghetti, Great Green Gobs, and other classics). Chorus in school, pep rallies, and much more. By the time I was in 8th grade, I was in my first rock band. i became a professional musician, but most kids don’t. Pretty much everybody loves to sing, or try to. Social music remains a great way to excite and engage human beings in group activities. 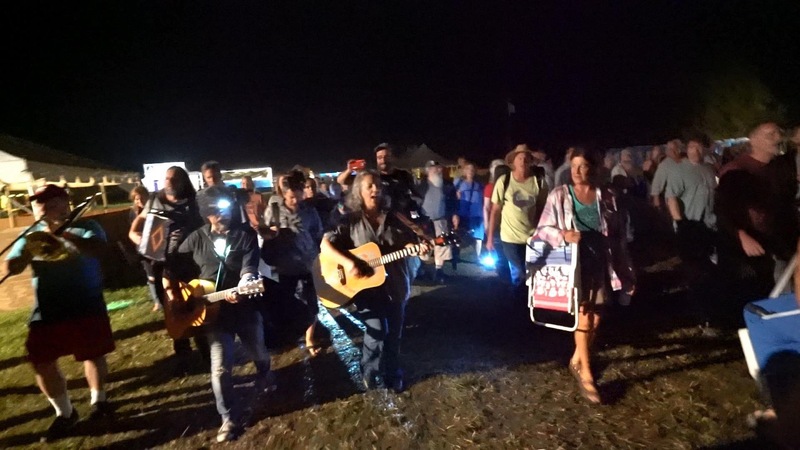 Whether you are singing protest songs at a political rally, singing your grandchildren to sleep, or singing “You’ve Got a Friend” with James Taylor on the lawn of the Saratoga Performing Arts Center, making music in a group brings us closer together. Everyone can sing, not always well, but the important thing is the act of singing itself. In my continuing work in music, I use social music in many ways, from encouraging audiences sing alongs to hosting open circles. Under the Big Orange Tarp, I used to bring a box of percussion instruments to festivals. Egg shakers, tambourines, bongo drums, claves, maracas, you name it. I drifted away from that because untrained musicians can be such poor time keepers. I like to attend drum circles with my pal Chadd Ferron. They are so fun, but they can be obtrusive late nights at your music festival or in urban settings. They may or may not be right for your constituency. Singing songs together can be fantastic. From folk songs, protest songs, inspirational hymns to Late night Beatles jams in Gene Shay’s room at NERFA. These always generate smiles and cameraderie. 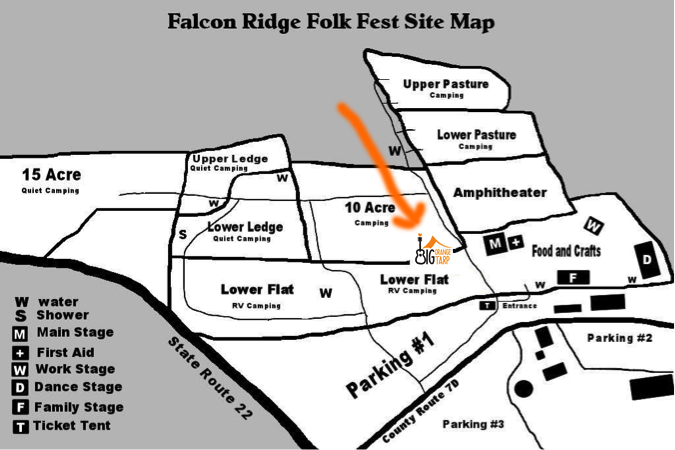 At Falcon Ridge this summer, Dan Navarro kicked off our loving tribute to David Glaser, Maggie Marshall, and Jimmy LaFave with a New Orleans style, second line processional from one side of the camp ground to the other, ending up at the Big Orange Tarp to kick off the tribute. The crowd was “All in” before our formal feature even began. Audience engagement and participation was fantastic. Some venues have group sings after their shows these can be particularly powerful in small house concert situations. Ireland is all about the pub sings, where people haul their chairs over into a corner and play together. Orchestrated jam sessions provide a place where wannabe professionals can noodle around quietly, testing their musical ideas to see what works and what doesn’t. When I was starting out, I always played along with records, but I can tell you first hand, that’s not as exciting as playing along with people. Many Americans are shy, socially inhibited, uncomfortable in their own skins it has been reported that many Of them fear public speaking more than they fear death. To stand in front of a group and speak extemporaneously is unthinkable for some, but to sing some Simon and Garfunkel or Phil Ochs, sharing that eloquence is far easier. So many people feel isolated and alone, unseen and unheard. They may not even realize it, but most people light up when they realize they are a part of something. It is natural to yearn for connection In a purely practical sense, you want customers coming back to consume your music, but trust me, that’s feels great when you discover your events are serving people in a deeper and more meaningful way. in my opinion, Folk Dance is making music with your body. our dance stage at Falcon Ridge has one of the most engaged and enthusiastic audiences that I know of. As a long time music listener, I can get mesmerized by a fantastic performance that I view only as a spectator, but the physical act of dancing is a full body, aerobic experience with a much broader emotional payload. 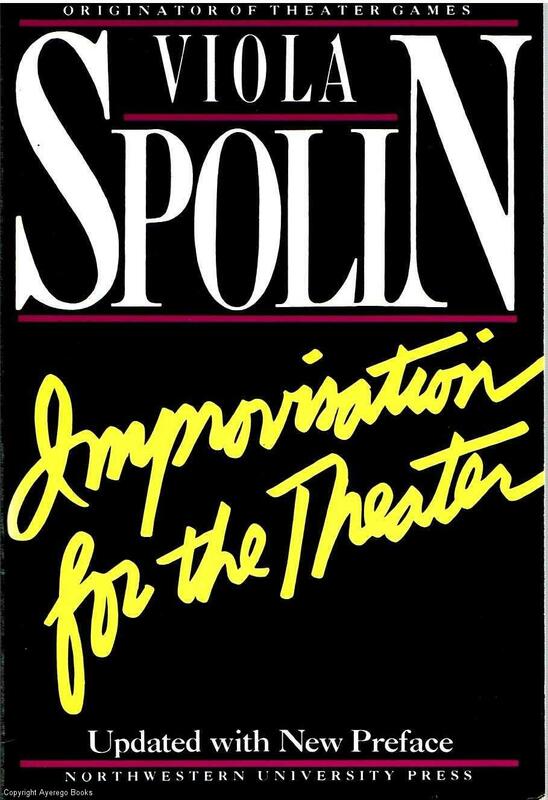 If you really want to see some fireworks, try workshopping some of the theatre games from Viola Spolin’s classic book “Improvisation for the theater”. Considered the Bible of Improvisational Comedy groups like the Second City or the Groundlings. It has been used with great success by musicians as well as actors and comics. It gets people laughing and thinking outside of the box. However you decide to incorporate social music into your programming, the big win is in audience engagement and customer loyalty. Just as volunteerism brings people back in the doors, so does getting them to be music makers, not simply spectators. I will update this with artist links before the conference. Sunday several one on one mentorings available. Sign up at mentoring desk. Discussing the plethora of streaming options and platforms coming online for musicians, ways to monetize those streams, the hardware and software necessary to look and sound good. Be there or be square. Also Join my facebook group Live Music Streamers. It’s been nearly 20 years since I attended Folk Alliance Regional Midwest (FARM). It was pretty anemic in those early days. (No juried showcases, no presenter presence…) it fell off of my annual calendar. But when I won conference admission in a raffle last year, I knew it was time to give it another try. I’m not presenting a workshop this time thru, but I volunteered to do 5-6 hours of mentoring and I would be happy to discuss absolutely anything with you if you sign up. I believe the signup sheets will be available at Registration. I’m also pleased to be presenting a Big Orange Tarp showcase round each night at the conference from 11:30-12 in the Access Film Music Room 124. Come give us a listen. Click the artist name to check out their website. For nearly 30 years, technology and greed made possible the model which fueled the explosive growth of the independent music industry. Prior to around 1985, making records was an expensive and complicated process. You needed to rent expensive studio time to record, mix and master your recordings. Records were manufactured in factories called pressing plants and required expensive mothers and stampers to create the finished recordings. 12” jackets, sleeves, and liner notes were expensive to design and print. But in the mid ‘80’s the CD came out. They sounded better and lasted longer than vinyl albums, so the record companies decided to charge a premium for the format, but they cost less than half as much to manufacture. Meanwhile quality home recording studios were becoming affordable and desktop publishing put quality graphics design within reach of anyone who had the eye to create it. And so the independent record labels and artists sprung into being. Radio and retail were still controlled by the Big 6 record distributors who hawked all the major labels, but the genie was out of the bottle and soon as many as 30% of record sales emanated from independents. Then the digital distribution sites like MP3.com and Napster were circumventing old school distribution entirely. It was an perfect storm of opportunity for the unsigned musician and they rushed in to take advantage of the windfall. Hundreds of musicians who had never seriously considered an original music career jumped at the chance to make their creative dreams come true. A model emerged that held for nearly 30 years where the average Jimi or Janis could write a dozen good songs (still the most important part of the equation), record them inexpensively, design and press their own CDs and derive about half of their annual income from the sale of these CDs at shows, over the internet, and (if they were lucky) maybe even thru conventional record stores. With cheap, seemingly limitless bandwidth available, video is now the preferred medium for engaging your audience. And arguably the best delivery platform for your videos is YouTube. 2. Brand deals, Sponsorships, and product placement can also generate income for your YouTube channel. Advertisers and other entities who strongly resonate with your message may want a firmer relationship with you than pseudorandom occasional ad placements. These agreements are negotiated directly and there is no standard contract or pay scale, but they can be very lucrative. Read more here. Here’s another article on Sponsorships. I think these have more income potential than AdSense, but if people are watching your content, there is no reason not to get the AdSense dollars too. And more tips on Sponsored content. 3. Affiliate marketing and hawking your own merchandise can also generate revenue for you. Online retailers like Amazon have affiliate programs where you earn a commission on buyers who you refer. This is a tangible benefit to the seller and it costs your buyer nothing extra. Amazon, eBay, and Rakuten have 3 of the best known affiliate programs, but there are many others. There are specialized musical gear affiliates programs thru Zzounds, Musicians Friend, Sam Ash, Guitar Center, and other companies that you can use to spotlight the products that you love and actually use. Commissions can range as high as 10%. Your fans may no longer buy CDs, but they still wear clothing and jewelry. Sell them something they will use. You can sell custom printed or embroidered t-shirts, sweatshirts, hats, bandannas, and other clothing and jewelry items that make them a walking billboard for your music. You can sell your original paintings, woodcarvings, salves, potions, and other handmade items. You may be able to crossmarket and sell on commission the items made by your other artistic friends. Fullfillment can be done thru eBay, Etsy, or your own website. 4. Live Music Streaming is an ideal way to reach out to audiences old and new. The low opportunity cost of streaming makes it ideal for even the most cash strapped musicians. The 4 biggest enemies of the traveling musician are gas, food, lodging, and time. They are the negatives in every calculation of whether or not to take a gig. Some live-streaming sites charge admission. Many have built in tipping capabilities. Even the totally free streaming platforms like Facebook, YouTube, and Instagram can direct listeners to your other revenue generators. If you have a smartphone and an internet connection, the cost of live streaming is almost zero. All it takes is time. You can amortize that time by streaming your live gigs, rehearsal sessions or other musical chores. You can reach people who might never be willing or able to attend your gigs and turn them into fans. It’s a great way to publicize your website, YouTube channel, merchandise, and crowdfunding campaigns. Learn more about live streaming here. Now is the time. Just like with YouTube, the early bird catches the worm. If you wait until everyone is live streaming, that marketplace is eventually going to be just as crowded as YouTube. Stake out your claim now in the electronic frontier. 5. Kickstarter, Indiegogo, and GoFundMe are popular crowdfunding sites. They help you leverage your fan base and others to finance projects you might not otherwise have the resources to even begin. Beyond giving your fans a way to participate in your next project, they also hold great potential for building public awareness for your work and your brand. 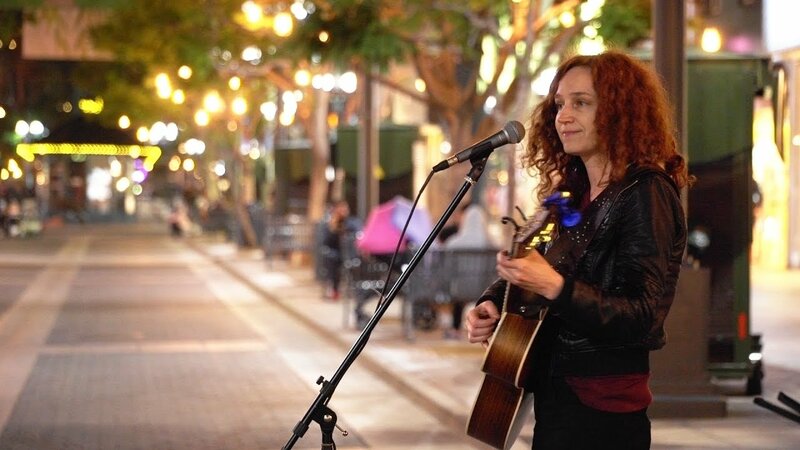 Mounting a crowdfunding campaign can be tricky, here are some tips. Here are more. And more. 6. Premium Content appeals to your SuperFans. There are various ways to accomplish this. People like access to exclusive content. This can be anything from rough song demos and informal videos, Private members-only live streams on Periscope, Access to hidden videos on YouTube. Personal photos. Even members only email newsletters or exclusive merchandise. Don’t lock away the Crown Jewels, but cater to the completist with a trove of materials that let them feel like the superfans that they are. 7. Patronage may be the ultimate way to recoup that lost income. America’s income inequality continues to grow. The rich get richer and the poor get poorer. Some people have a LOT more disposable income than others. The simplest way to accomplish this may be with an honest discussion of the financial impediments standing in the way of the furtherance of your musical career and a simple PayPal.me link on your website or monthly newsletter. This could happen once in a blue moon or could be a perpetual link on your website. I have one on BigOrangeTarp.org that I never promote, but every once in a while, somebody sends me a little cash. It is never expected, but always appreciated. Bonus: On Demand audio streaming thru subscription services like Spotify, Apple Music, and Pandora is one of the primary ways mainstream artists are monetizing their music. In a perfect world, the lost CD revenues would have just magically reappeared in this column as the CD sales dwindled. But the music industry’s long tradition of fleecing artists was hard at work when these services came into being. There are executives with 6 figure incomes running these services who have never written a song in their lives, while prolific songwriters reap minuscule rewards. Like YouTube, a few creators make 5 figure incomes, the vast majority get paid very little. a hit on Spotify may pay the writer $3-5000, but few writers can support themselves with streaming income. But there may be hope on the horizon. There is a bill before Congress right now that aims to bring streaming revenues up to a reasonable rate and end the excessive exploitation of the industry. It is called the Music Modernization Act. This is very good news. I don’t know how soon it will take effect or exactly how dramatic a difference it will make, but consensus is that this should help a lot. All it needs now is the Presidents signature. He doesn’t like to read, but it is assumed the bill will be signed into law without delay. In the meantime, if your music is on Spotify, you will generate a lot more income if it is picked up by a popular playlist. Here is their wisdom on that. And here is some 3rd party advice. And one more… and here’s this advice on what to do after you score a Playlist. I’m thrilled to be returning to SERFA once again this week. If you want to catch up with me for some one on one time at the conference, let me know and we’ll schedule something. I’ve been learning more and more about the live streaming opportunities that are out there and I’ll have my MEVO event camera with me if anyone wants a demo.